As part of its oversight of private lodging businesses—which will be permitted to operate starting on June 15 (Fri.)—starting from March 15 (Thu), Shinjuku City is accepting applications from business operators planning to start such businesses. 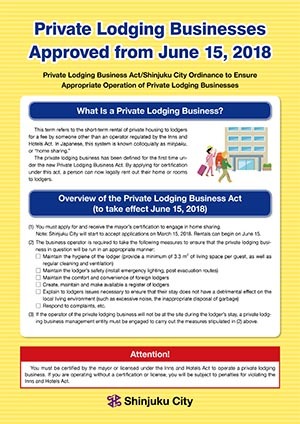 To ensure that private lodging businesses are run properly, Shinjuku City has summarized the Private Lodging Business Act and city ordinance in an easy-to-understand leaflet in Japanese, English, Chinese and Korean. A rulebook for the operators of private lodging businesses is also available from March 5 (Mon.). It includes descriptions of the laws and important checklists with requirements for properly managing such a business, which operators should check before starting the business. Please call for more information on private lodging businesses. Branch Offices, City Administration Information Center (Shinjuku City Office Main Bldg. 1F), Sanitation Division and other locations.